Here I am using ArcGIS to economically value changes in coastal aesthetics to quantify changes in ecosystem service delivery. The context is near and off-shore development projects (wave energy facilities and fin fish aquaculture) off Vancouver Island. This analysis was part of the Stanford Woods Inst. Natural Capital Project’s training session March 25-28 2014, for which I received a scholarship to take part. In red is the area of interest for which we used a digital elevation map (DEM) to get to the frame of view in relation to the coast. The blue points are future aquaculture sites or wave energy sites. 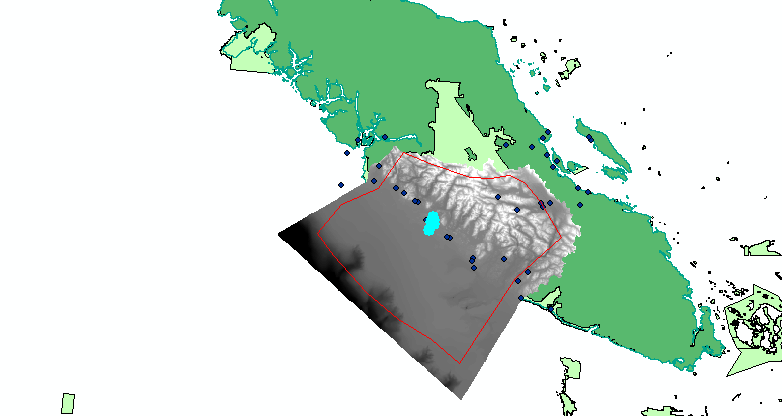 Pictured below is the same site, this time with the land in dark green, the marine protected areas and national parks in light green, and future near and offshore coastal development as blue points. I left the DEM filled in with the color ramp in grayscale to get a sense of what possible viewscape they were having us generate when we ran the model in InVEST, which created a valuation output. This valuation output took into account elevation of populated places, located within protected areas, and line of site to near and off shore development projects. I highlighted specific cited aquaculture sites in order to only model their inclusion into the changes in viewscape valuation. This entry was posted in GIS and tagged economic valuation, Ecosystem Services, GIS, NatCap, Stanford. Bookmark the permalink.